We Offer High Quality Of Bushes For Silent Block. These are of two types a] Cylindrical type b] Collar type or Flange type. 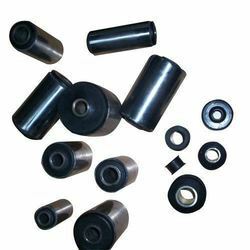 The product consists of two concentric steel sleeves with rubber securely bonded between them. The product is designed to take tortionalmovements , axial and radial load. We are offering Silent Block Bush to our clients. Riding on vast volumes of expertise in this arena, we are occupied in offering Silent Block Bushes. 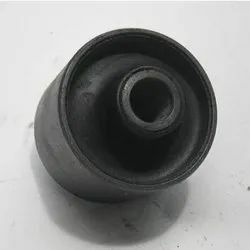 The injection molded silent block bushes consists of two or more concentric metal parts with rubber bonded between them. These are designed as mainly to absorb any kind of Torsional, conical or axial load applied onto the system. The rubber part is minimalistic but yet is designed to take up loads of upto 40 Tonnes. These components are part of suspension systems used in Automotive, Railway, and Industrial sectors. - To reduce comprehensive and tensile stresses. - To achieve vertical stock resistance.